The rotationally moulded product is of a single skin and completely weld-free; in other words, there is no area in which a fracture or any form of leakage could occur. Our final tests incorporated the “Polycistern”, and the results proved efficient flushing at 6 litres per function, although considerable success was achieved with full flushing as low as 4,5 litres. 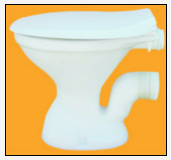 In other words, our “Polypan” and the “Polycistern” form the perfect marriage. Apart from these features, the “Polycistern” is fitted with a flip button in the lid as opposed to a conventional flushing handle, whereby flushing of the toilet may be terminated at any stage between 1 and 6 litres. Length 470mm (front to rear). Design A weld-free pan which complies with all regulations pertaining to the design of P-trap w.c. pans. Production Rotational moulding rendering a high quality unbreakable smooth surface throughout. Fixing Provision is made for securing to the floor by using two coach screws and Fischer plug assemblies. Flushing The pan is designed to flush with as low as 4,5 litres. Seating The pan is purposely manufactured so as to be comfortable to use without incorporating a separate seat, especially when used in public toilets, schools, prisons or any other area where vandalism might occur. Alternatively, we offer a high quality double-flap p.v.c. seat as an optional extra item. General Under no circumstances should the product be assumed to be an inferior third world pass-off for a ceramic p-pan;to the contrary, the pan is aesthetic, and perfectly acceptable and durable to meet requirements in all walks of life.